Last night the Villanova Wildcats came into The Dunk fresh off a win at #3 Syracuse. They have a game Saturday against #20 Georgetown at home. Problem is, they had a game last night against a lowly Providence Friars that they didn’t show up for. The Friars jumped out to a 6-0 lead in the opening minutes and never looked back making it two wins in a row against ranked teams for the first time since 1998. I had numerous chances to go to the game last night but passed them up to watch the game at home with my father. He wasn’t prepared for my newfound way of cheering for the Friars. 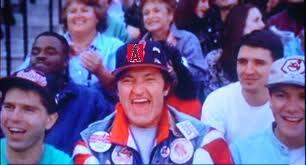 I have become Randy Quaid from Major League 2. After faithfully following the Friars for about 15 years, I have gotten to the point where I realized that PC plays everyone tough for 37 minutes and then blows the game in less than 3. I have become negative and always looking for what’s wrong and jumping on Keno Davis every chance I get. Last night, was a night where my father was right and I was wrong. I was furious in the beginning of the first half with PC’s shot selection. They took 10 threes in the opening 9 minutes of the game. I remember saying “Here we go, live by the three, die by the three.” My father came back with: “I like this strategy, it has Villanova back on their toes and now they are trying to mimic what PC is doing.” Point to pops on that. Villanova definitely fell into the trap of playing some helter skelter basketball, shooting 32% from the field and 18% from downtown. I also didn’t like Keno going with a four guard set. I even tweeted, “Well, now we are going to get killed on the boards.” (Villanova had 21 offensive rebounds). The problem is that Bilal Dixon has been useless this season and has forced Keno’s hand into playing a lineup that puts Marshon Brooks at the 4. I was thinking Villanova would be able to handle Gerard Coleman and Vincent Council because they have two of the best guards in the country in Corey Stokes and Corey Fisher. I was wrong again as the Corey’s were a combined 4-26 from the field, 1-13 from 3, and combined for 14 points. Marshon Brooks has to be commended for still having a solid game despite being clearly off all night. He was 0-8 from downtown and 4-15 from the floor but was still able to create offense for himself by getting to the charity stripe 14 times and hitting 12. He had 20 points, 8 rebounds, 2 blocks, and 2 steals on his 22nd birthday. A win over the #7 team in the country is a nice way to celebrate. love this Coleman kid. He had 16 points last night and is a lot of fun to watch on the break with Vincent Council. Speaking of Council, (he being that freshman last year that I was excited about) he had a stat stuffing night with 16 points, 8 rebounds, and 8 assists. He was also 3-4 from three point land and although erratic at some points in the game, he overall wasn’t bad. He is still learning how to control a game and understanding when it push the ball up the court and when to slow things down. The bottom line after this past week for the PC Friars is that they now know how to win. They know how to close out ball games. Something they haven’t done since the days of Ryan Gomes. 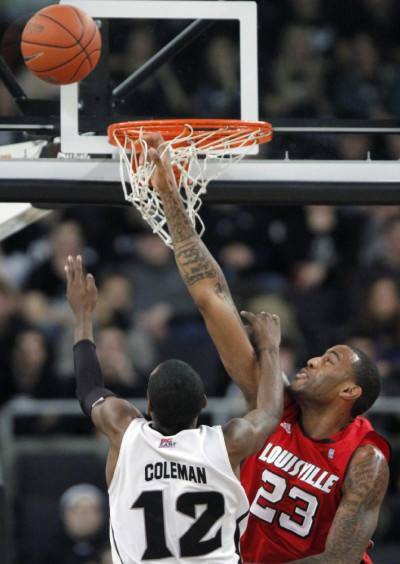 It will be sad to see Marshon go, as he was the one constant during a time of turmoil in the PC program. But otherwise, as Keno reminds us every fifteen minutes, this is a very young team making the present a learning experience but the future very bright. But hasn’t that been the case the past 4-5 years? NEXT UP: @SETON HALL, SUNDAY, JANUARY 30, 2PM. With Matt’s computer down, I am stepping in for him on posts he’d usually he make. He will be back on Tuesday. The Friars fell to the Red Storm last night 67-65 in Providence. The Friars were down by as much as 10 in the second half and came back to tie the game with less than 2 minutes left. But a wide open Paris Horne buried a three in the corner to put the Red Storm ahead for good with less than 35 seconds left on the clock. On the Friars ensuing possession, Marshon Brooks was called for an offensive foul when he drove to the rack. Providence couldn’t stop Dwight Hardy (21 points) or the Red Storm in general as they shot over 50% from the field. Providence did force 16 turnovers, led by 4 steals from Vincent Council. The Friars were atrocious from behind the arc shooting 6-21 (28%). Most of those threes were forced as they went deep into the shot clock on several possessions and were forced to hoist a three to negate a shot clock violation. My biggest gripe with the offense last night was the lack of movement. I can’t stand watching 5 guys stand still and pass the ball along the perimeter hoping something opens up. It just defies logic. The Friars are at their best when Vincent Council and Marshon Brooks are driving to the paint and kicking to open jump shooters or guys down on the block. Marshon was solid with 20 points going 8-14 from the field, 4 rebounds, and 3 blocks. He has really impressed me this season with his leadership qualities and his talent on the floor. He has really improved from just a season ago. I would think an NBA team would give him a look in the second round of the draft. I whole heartedly disagree with Matt’s notion that the Friars are deep this year. The bench chipped in 12 points last night ( 9 from Duke Mondy). They shot 4-16 (25%( from the field and turned the ball over 4 times. The Friars go six deep (Brooks, Council, Gerard Coleman, Bilal Dixon, Kadeem Batts, and Mondy). After that, there hasn’t been much production from the bench players. In order for the Friars to be competitive in Big East play, there needs to be some form of production from the bench. Or else the starters are in for a long, tiring season. WHAT I SAW: Coming into this season, there were few Friar fans that had high hopes for the 2010-2011 PC men’s basketball team. The Friars roster consists of two seniors, Ma rshon Brooks and Ray Hall (I’m excluding Chris Carter), and the remaining 13 players are either sophomores or freshmen. Even with sophomores Vincent Council, Bilal Dixon, and Duke Mondy seeing significant time the previous season, this team was as green as they come. In order for the Friars to have any sort of success, they needed Marshon Brooks and Vincent Council to lead the team, and then receive significant contributions from Dixon, Mondy, and members of their freshman recruiting class (particularly Gerard Coleman). So, what did we get? Marshon Brooks is tenth in the country in scoring (second in the Big East) averaging 23.1 points per game and accompanies that with nearly nine rebounds and three assists per game. Vincent Council is eighth in the nation, averaging nearly seven assists per game to go along with sixteen points and five rebounds. Freshman Gerard Coleman is third on the team in scoring, averaging 10.4 points per game. Redshirt freshman Kadeem Batts and Bilal Dixon have controlled the paint (when they have stayed out of foul trouble) defensively and have rebounded on both sides of the court. Duke Mondy continues to improve defensively, and is beginning to find his stroke from beyond the arc. Contributions from freshmen Bryce Cotton, Ron Giplaye, Dre Evans, and Lee Goldsborough have also been key elements0 to the Friars’ early season success. It is no secret, the Friars do not play a very tough out-of-conference schedule. But, when you play in the Big East, there is no need to play a tough out-of-conference schedule when you have anywhere from 6-10 ranked teams in your conference. The Friars have jumped out to an 11-2 start, which is the best start to a season that I can remember. Their only two loses came against La Salle and Boston College. Keno Davis has this team playing very good basketball right now, and the Friars look poised and ready to start Big East play on December 28th at #5 Syracuse. THE GOOD: What has been good so far this season for the Friars? To start, the defense needs to be mentioned. The Friars defensive statistics certainly do not jump ou t of the page at you because of their brilliance, but from where this team was to where they are now, the transition is pretty astounding. Last season, the Friars were one of the worst defensive teams in the country, allowing opponents to score an abysmal 82.2 points per game against them. Although they were also one of the highest scoring teams in the nation, often times when a stop was needed towards the end of the game, nobody from PC could get it done. This season, the Friars are allowing 68.2 points per game. That number is still high, but it is 14 points less that last season! Aside from the statistics, the Friars have shown the ability to clamp-down defensively towards the end of games this entire season. Late game defensive stops helped the Friars grab wins over Rhode Island, Alabama, Northeastern, and Wyoming. If there is one person in the world that despises the way that Marshon Brooks plays basketball, it is me. Ask anyone who attends games with me. Every time Brooks touches the ball I make it a point to yell, “Marshon don’t pass!” Brooks has the uncanny ability to pass when he should be shooting and to shoot when he should be passing, but I’ve got to give credit where credit is due. Brooks has put the team on his back so far this season, and the results have been pretty damn good. Not only has Marshon been scoring like a mad-man, but he has finally dedicated himself to rebounding, which has the potential to be one of the best parts of his game. I’ve followed the Friars’ 2010 recruiting class ever since the 2009-2010 season ended. When I saw that Keno Davis was able to recruit players with the ability level of Gerard Coleman, Dre Evans, and Ron Giplaye, I was very excited for the future of this team. But, with freshmen comes inexperience and growing pains. To my amazement, these kids have stepped in and contributed right away. Coleman looks like a star in the making. He is 6’4″ and a lean 170 lbs, but has a knack of getting to the rim and finishing amongst the bigs. Bryce Cotton was a late recruiting addition after the loss of Joe Young, but the 6’0” Cotton has a ton of athleticism and his game is beginning to stretch beyond the arc. THE BAD: Although the Friars are off to a great start, now that Big East play is upon us, there are certainly areas that need to be improved in order to see success in conference. First, the bigs need to stay out of foul trouble. Countless times have I taken my seat in the Dunk, watched the openin g tip, and within two minutes Kadeem Batts is getting yanked because he picked up a foul or two. This forced Brooks to move down to the four (and at 6’5” 190 lbs he is no 4) and puts more pressure on Dixon to block shots and rebound. In order to compete in the Big East, the Friars need to have their full arsenal of big men available at all times (Dixon, Batts, Giplaye, Goldsborough, and Hall). In classic Providence College fashion, the Friars have become accustomed to starting off slow and then rallying back in the second half to finish teams off. Although their offense is capable of putting up points in a hurry, being down 10 points at the half to Syracuse, Pittsburgh, Villanova, Georgetown, etc doesn’t bode well for your chances of winning. It is important for the Friars to come out of the gate, dictate the game to their pace, tire teams out, and then use their depth and youth to their advantage. OUTLOOK: The Big East is loaded on a yearly basis, and this season they seem to be as stacked as ever. Currently, there are 5 Big East teams ranked in the top 10 in the country, 7 total in the top 25 (ESPN poll), and another 2 receiving votes for the top 25. That makes nine teams either in or considered for the top 25. Anyways, the Friars are young and small, which are two things that you do not want to be when playing such stiff competition. That being said, I think that this team is talented enough to at least compete in the games against the top tier teams, and should be able to win their fair share of contests against the rest of the league. The most important thing for PC is for them to beat the teams that they should. The Friars need to beat teams like Rutgers, DePaul, South Florida, Seton Hall, and St. John’s. As usual, the Friars have a tough schedule, and their road games will seriously test this team’s youth. For the remainder of the season, I will be posting a recap of every game that the Friars play. So, if you are a Friar faithful like I am, make sure to stop by NTCF after all PC’s games.